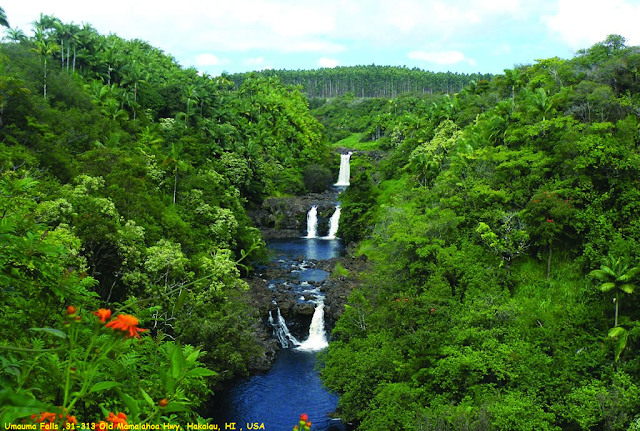 The Umauma Falls are located on the Umauma River on the Big Island of Hawaii, approximately 16 miles north of Hilo. They are unique in Hawaii as being a series of three waterfalls in close proximity. They are easily viewed from an overlook located on private botanical garden property accessible for a fee. The overlook was constructed in 1996 by Walter L. Wagner who was developing the World Botanical Gardens with the waterfalls overlook as part of the tourist attraction. The word Umauma means 'constantly flowing' in the Hawaiian language, and it is the most northernly river to have a continuous flow and not dry up during the dry season. The three levels which Uma Uma Falls flows down resemble great lava stone steps with recesses that create tranquil little pools surrounded by tropical plants and trees.